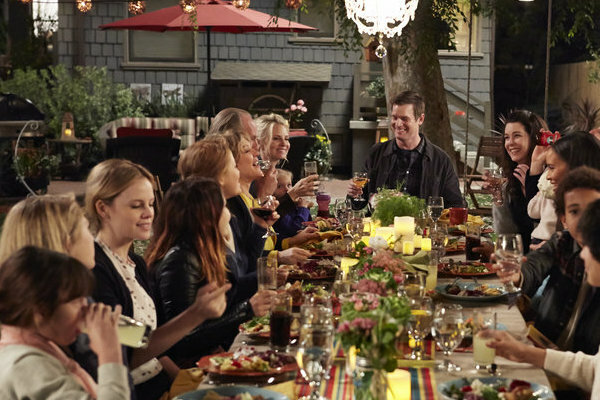 Another season of the infuriating but fascinating and often lovable NBC show “Parenthood” has just finished up, and as usual, the season finale is so good and heartfelt that I almost overlook all the things wrong with this year’s show. Like the insane storyline of Kristina running for mayor of Berkeley, or even more insane idea of her and Adam opening up a charter school for autistic kids. Or Sarah Braverman being a horrendous mother and all-around not-great person, yet getting more men chasing after her than any woman her age in history. The finale was sweet and tender with the whole Braverman family house being sold storyline coming to an end, and Drew going to see his new girlfriend, and Haddie suddenly being a lesbian (my wife and I both thought it was hilarious that the kid grew up in free-love Berkeley, yet discovered she liked girls at Cornell). I don’t know if NBC is going to renew “Parenthood,” it seems to always be up in the air. But this show has tremendous heart, and for all its flaws, continues to win mine. Please, NBC, keep it on the air. Couple of great nuggets in this story: Everything that happened to the characters on the show actually happened to one of the show’s writers (man, that episode with the fake keg party must’ve been hilarious in real life, too), Lauren Ambrose from “Six Feet Under” was almost Lindsey Weir (she’d have been great), and there were some awesome storylines for Season 2 that never got to happen (Daniel in jail? Yeah, that would’ve fit). This was such a classic show; so wrong that it only got one season. **Finally today, Sunday was a great day (mostly) for me. My mother hosted a post-Passover lunch for our extended family, and I got to see some people I hadn’t seen in a while. We ate, we laughed, we ate some more, and I got to play catch with my 9-year-old nephew, which is always a good thing. Anyway, the Rangers and Flyers played Game 2 of their Stanley Cup playoffs first-round series Sunday, and me and the enemy watched some of the game together. My bro-in-law and nephew cheered when something good happened for Philly. I cheered when something good happened for the Rangers. They got to cheer more. I didn’t get to taunt a 9-year-old, which is probably a good thing. The Flyers won. Then we ate. 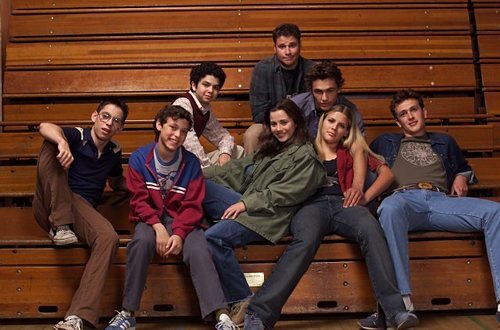 I freely admit to giving anything Judd Apatow does a chance, because he gave me and the rest of the world “Freaks and Geeks,” one of the best TV shows I ever saw. Apatow does a little too much gross-out humor for my taste, but his movies are funny and have heart and he really knows how to write “real people” in his movies. 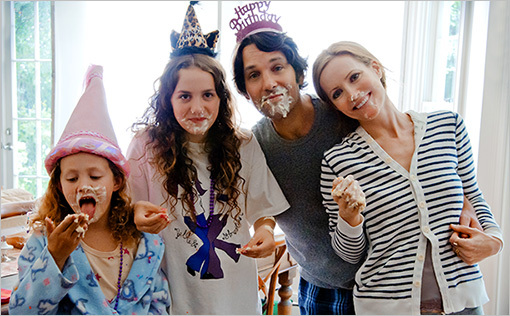 Still, I was pretty surprised at how fantastic “This is 40” was. I saw it on New Year’s Eve and it had me laughing just about the whole way through. I know critics have given it mixed reviews, but I loved it. Paul Rudd is terrific, Albert Brooks is his usual hilarious self as Rudd’s money-mooching, triplets-having father (I continue to argue that Brooks is underrated; he’s hilarious in everything), and even Apatow casting his own daughters in the flick works, because they’re cute and funny. Leslie Mann was just OK; she kind of whines a lot even when she’s not trying to, and I just don’t think she’s that good of an actress. But the script is really funny, the supporting cast is great (Megan Fox provides some good moments), and as someone nearing 40 myself, I could sorta empathize with the characters. Ignore the critics; go see “This is 40.” And if you don’t bust a gut at the scene involving Rudd and a hand-mirror, well, you might not laugh at anything. **As I’m just catching up on the InterWebs after my vacation, I missed this fabulous end of 2012 video. The 50 best viral videos of 2012, all in one video. For my money, No. 11 (the Isaac Lip Dub Proposal) is still the video of the year. And yes, I just watched it again. **Finally, with a couple of long plane flights and some nice laying on the beach/pool time, I got to plow through four books on vacation. Some mini-reviews of three of them (the fourth, Mark Kriegel’s biography of boxer Ray “Boom Boom” Mancini, I gave up on halfway through. 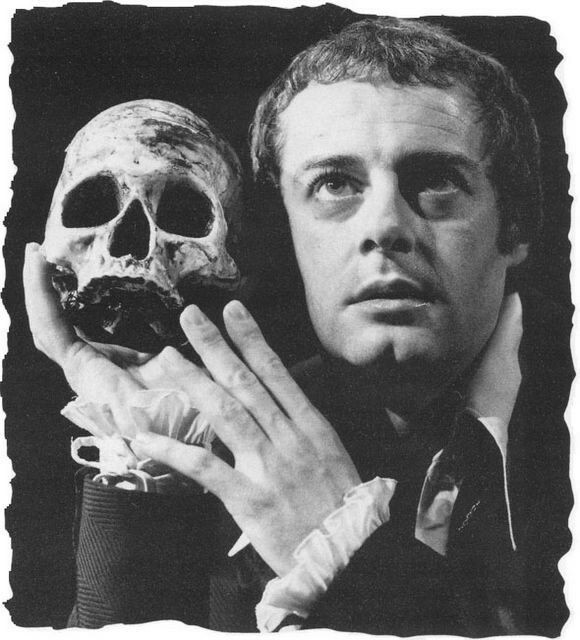 Just didn’t like the writing style, and wasn’t that interested in Mancini’s life, to keep going). — The Obamas, by Jodi Kantor. Fascinating biography from a N.Y. Times correspondent on the First Couple, focusing on them as individuals but also as a couple from 2008-2012. I’m a political junkie so I ate up the “inside politics” stuff (man, Michelle Obama really didn’t like Rahm Emanuel), but the marriage dynamic between the Obamas is a lot more complicated than I would’ve thought. Kantor seems pretty slanted against both Barack and Michelle for large parts of the book, and she takes a few surprisingly nasty shots at each. But the honest reporting is terrific, and we see Michelle as a tough-as-nails, backroom dealer constantly pushing her husband to try to do better. — My Life As an Experiment, by A.J. Jacobs. Jacobs is a really funny writer for Esquire who does these bizarre “year in the life” books; one was reading the encyclopedia cover to cover, another was about living exactly as the Bible says for a year. This one is a series of one-month experiments where Jacobs goes far from the norm; he tries something called “Radical Honesty,” he pretends to be a hot woman in an online dating experiment, and he lives as George Washington for a month. It’s hilarious and surprisingly insightful; his prose is funny and to the point and he doesn’t waste time with boring details. His wife is beyond saintly for enduring his craziness, by the way. — The Best American Sports Writing, 2012: I have read every volume since it started in 1991 or so, and each year I’m amazed at how much good sports journalism there is. This year’s selections are all over the place, like usual; a few stories that stood out were S.L. Price’s tale of a Aliquippa, Pa. and its high school football team, holding a town together, and a great story by Bill Donahue in Runner’s World about a woman whose brain surgery made her a stronger endurance runner. If you love great writing, BASW always comes through. And a happy Friday to all of you fine people. Today’s Good News Friday starts with news that is good news for canines and people who don’t like driving. Apparently three dogs in New Zealand are being taught to drive. I know this sounds like the beginning of a joke, but it’s true. Watch the above video and be very afraid. Me? I hope all dogs learn how to drive. I’m sick of the Long Island Expressway traffic; with a pooch at the wheel, I can take a nap in the back. Or, since roles will be reversed, I can stick my head out the window with my tongue out. **To all my Jewish readers, I wish you a Happy Hanukkah. The annual eight days of presents and lighting menorahs begins Saturday night, so as always here on the ole’ blog, a little Adam Sandler to get us in the mood. This song still cracks me up whenever I hear it, especially the “fine-looking Jew!” part. **Finally, oral histories of news events and pop culture seem to be all the rage on the Internet these days; seems I can’t go more than a day or so without seeing one. Like millions (OK, thousands) of others, I caught up in re-runs a few years after it went off the year, and felt cheated that such an honest, painful, hilarious look at high school only got to do 18 episodes. Lots of great material in here, including Judd Apatow knowing Seth Rogen would be a star right away, and how the whole cast pretty much had a crush on James Franco. Read it weep that we never got to see Bill Haverchuck go out on a date. Oscar noms are mostly on-point. And anti-semitism in pro hockey? A rare Wide World of Stuff teaser: Tomorrow I will tell you about my crazy car adventure Tuesday night, when a huge rainstorm, slick tires, and a little carelessness found me and my Toyota stuck in a ditch for an hour on the side of the road (we’re both OK, thanks for asking). Always love Oscar nomination day. Usually I see the list come out and I get annoyed that my favorite from such and such movie got snubbed. But I have to say, I think the nominees are pretty damn good this year. I’m still not a fan of the whole 10 best picture nominees; I thought five was fine. But a lot of my favorites got picked this year. 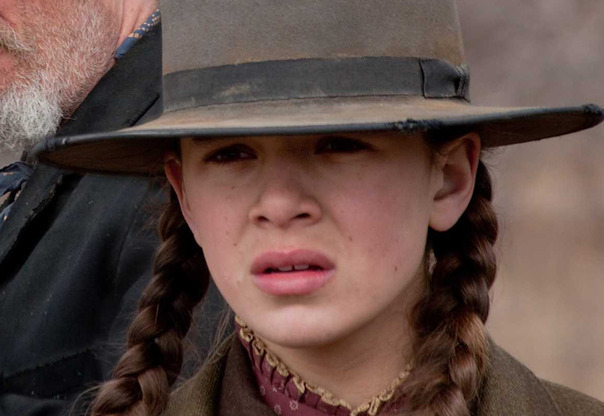 I am very glad “True Grit,” and Hailey Steinfeld, got nominated, and I hope Melissa Leo from “The Fighter” wins best supporting actress. Also thrilled to see “Toy Story 3” get a Best Picture nominee, though I highly doubt it’ll win. I was surprised that “Waiting for Superman,” the documentary about the failing school system in America that everyone loved, didn’t get tapped. Still, a darn good group of nominees, methinks. **This story actually surprised and disturbed me when I saw it Tuesday night. Jason Bailey, a former hockey player in the NHL’s Anaheim Ducks organization, has filed a lawsuit against the organization and one of its minor league teams, the Bakersfield Condors, alleging anti-Semitism and a constant stream of verbal harassment. 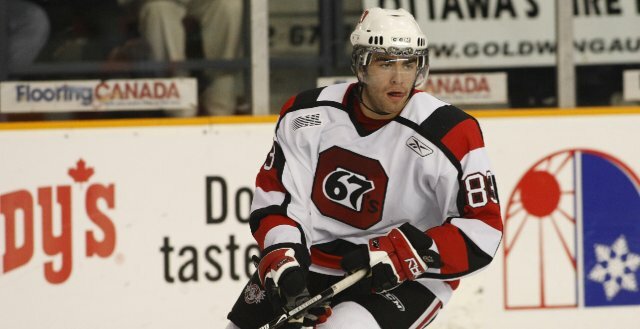 I know what you’re thinking: There are Jewish hockey players? Yeah, I was surprised too, and I’m Jewish. But hey, there are several in the NHL, including the Montreal Canadiens’ Mike Cammalleri and the Washington Capitals’ Jeff Halpern. Beyond the absurdity of that statement (everyone knows my people are good with money. 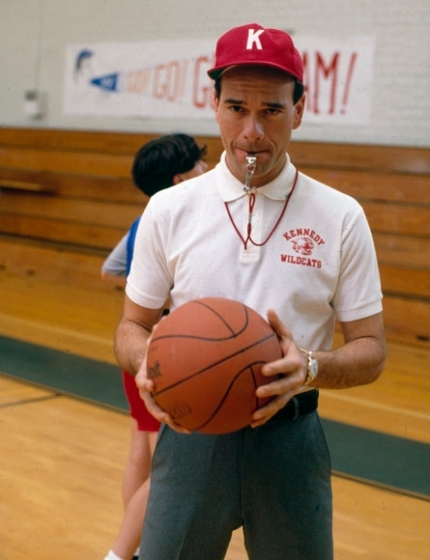 Remember the great “Freaks and Geeks” line from the Jewish character Neil Schweiber: “I was elected class treasurer, and I didn’t even run.”), I’m surprised that, if true, the coaches would single out Bailey’s Jewishness as something to make fun of. I’ve been around hockey players a lot as a reporter, and let me tell you, these guys will make fun of anything about their teammates. How they look, how they dress, how they skate, everything. Never once did I ever hear religion brought into any discussion. Hockey players simply don’t care. I’m not saying Bailey is making this stuff up; if true, the Anaheim organization absolutely should’ve disciplined Raymond and Pederson. I’m just surprised that any hockey player, with so many other things to choose from in a ragging on a guy, would go after another’s religious beliefs. What, the guy wasn’t ugly enough to make comments about his face? Turned 35 on Tuesday. Didn’t sweat this birthday as much as some others. Sure, I felt sad a little that I’m getting older, and that I’m no longer in the coveted advertisers’ 18-34 demographic, and I’m now just as close to 40 as I am to 30 (and as you read this, I’m one day closer!). My day was made by many things, including so many warm wishes from friends and family (I swear, every birthday turns into a “This is Your Life” it seems; people from different stops along the journey check in, and it’s wonderful), a terrific dinner with my wife, and some great presents. My favorite gift? A wonderful one from my wife. She knows what a huge fan I was of the late, great television show “Freaks and Geeks.” And so I got the “Freaks and Geeks” ultimate DVD collection, with all 18 episodes on tape, plus director’s commentaries and all kinds of cool other stuff. The writing is so dead-on perfect, the acting is great, and the realism of the show drips through in every scene. Highly recommend checking it out on Netflix or whereever you can find it. Heard about Diane Falanga’s new book on “CBS Sunday Morning” this week. It’s called “P.S. I Hate it Here: Kids’ Letters from Camp.” She’s gathered hundreds of real letters from people across the country, all telling about the horrible and wonderful adventures at camp. I wanted to be upset and angered and outraged when I heard that Brett Favre, he of more “retirement” pronouncements than Larry Holmes and Rocky Balboa combined, announced Tuesday he was coming back to play for the Minnesota Vikings. I wanted to be ticked off that Favre had again lied to everyone’s face when he declared back in July that he was definitely retired for good. You know, kind of like when he said after leaving my beloved New York Jets after last season that he was through. And when he retired as a Packer after the 2007 season. And when he retired … well, you get the jist. But I just couldn’t work myself into a froth over it. To me, Favre’s just not worth it. He’s clearly a raging egomaniac who has now held 3 (count ’em, three) franchises hostage over the past two years, while we all waited to see what King Brett would do. 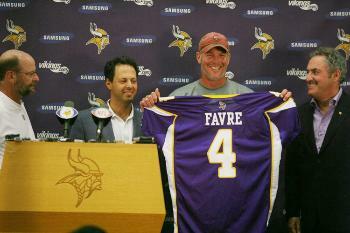 — Can Vikings fans really just forget the last 16 years of hating this guy and cheer their guts out for him? Forget where I read it today, but this is like Derek Jeter putting on a Red Sox jersey, or Larry Bird getting traded to the Lakers. The Purple-clad Vikes fans hated No. 4’s guts for almost two decades, and now they’re going to pin their Super Bowl hopes on him? Definitely a weird set of emotions today if you’re a Vikes fan. — Another question: Did Brad Childress and Co. watch any of the last six Jets games last season? Because I did. And injury or no injury, Favre has nothing left. I don’t think he’ll lead the Vikings to the Super Bowl anymore than Sage Rosenfels would’ve. — Am I bitter as a Jets fan? Not really. I’ve said repeatedly that I loved that the Jets went and got Favre last yea, and that I was equally happy when he quit. It was a gamble worth taking, and I really don’t care about him anymore. — Will Packers fans boo Favre at Lambeau this year? Not sure. The question was tackled in a good SI.com column from Don Banks, and Packers fan and author David Maraniss said he wasn’t sure. Packers fans are wildly loyal and I just don’t know if they have it in their hearts to boo their legend. Then again, I was just perusing the message boards on the Milwaukee Journal-Sentinel’s Favre story, and well, the mood is not very friendly. Anyway, I’m done with Favre. Play, don’t play, I really don’t care. Just for the love of God, don’t ever actually tell us you’re retiring again! — One more beauty of Facebook: It has completely ruined the ability of friends to say they forgot your birthday. If you’re Facebook friends with someone, there’s a little application on everyone’s home page that reminds you of all your friends’ birthdays. It’s really quite wonderful; heard from so many people yesterday with good wishes. Would they’ve remembered without Facebook? Probably not. But it’s just one more nice way to stay in touch in our incredibly disconnected world. **I’ve watched the Usain Bolt race a few more times since the weekend. I think I may have to do a separate post on him soon; I’m just so blown away by what he’s doing to track and field. He’s taking his sport to a whole new level. **Finally, Democrats in Congress =absolutely spineless jellyfish. So pissed off at my Party right now. Why must we always, always, screw things up when we’re finally in charge? Push a damn health care bill through, you’re in the MAJORITY!